It’s the new year, a time when we reflect on where we are and the changes we want to make in our lives. It is so easy to focus on what we don’t have-the strength and body of our youth, the bad habits we accumulate, the things in life we want to change. And if we are military parents we cannot help but think about our children and the uncertainty that surrounds loving a service member. It feels like something is missing because someone usually is. I find a big part of my resolutions every year are looking at me and how I make that transition to fill that gap. I miss my kids and the my time raising them. But they have grown and flown and I am also so proud of them and their service. So what do I do as I try to move on to rich life with an empty nest and multiple deployments? 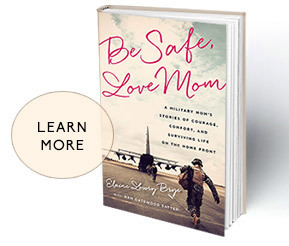 I have chronicled some of my strategies in my book “Be Safe, Love Mom: A Military Mom’s Stories of Courage, Comfort, and Surviving Life on the Homefront. Find a battle buddy, get moving and get outside, immerse yourself in a project to give you fulfillment, rely on faith-these are the time tested strategies that I have used to power through 12 deployments. It’s certainly not easy. But it beats being curled up on the floor in the fetal position. I continue to look for ways to manage the stress and enrich my life as I encounter things I cannot control. I just came across this video the other day. It was made by Forest Hill Church in Charlotte for the Christmas season but the message rings true every day. As someone who spent a year in Afghanistan in a war zone I have lived with no reliable power, intermittent heat, dirty water, and danger everywhere, much like many of our deployed children. I am grateful to be able to take a hot shower, and have a steady source of food, and the ability to use technology to stay connected. As I look forward this year I am deciding to resolve to be grateful for the basic comforts we have in life, many of which are secured by our kids’ service. I will be creating a gratitude jar. Even in the midst of hard things we can find something to be thankful for. Looking for that joy can be a fuel to power us through another year. Please click on the link Christmas Presents , watch and let me know what you are grateful for.